MOST OF US have a favorite fairytale, one whose peculiar blend of magic and danger we recall clearly at any age. But which aspect explains the story’s enduring hold—the glittering enchantment, or the dark violence that undercuts it? Consider “The Twelve Dancing Princesses.” Do we remember the dozen flawlessly beautiful sisters, the forest of gold, silver, and diamond trees they slip into each night to dance their shoes to pieces? Or do we remember their dark side: that they drug their suitors to protect their fun, unruffled when the prank turns fatal? Probably we remember both. Like so many other tales, we owe “The Twelve Dancing Princesses” to Jacob and Wilhelm Grimm, brothers and scholars who collected German folktales for study, then realized their immeasurable appeal for the young. The Grimm tales turn 200 this year, and with the anniversary comes a new book of 50 stories, edited by Philip Pullman—a writer who seems well-equipped to understand the tales’ dual nature. Pullman is the British fantasy author best known for the ethereal His Dark Materials trilogy, books that contain wonders—doors between worlds, spirit companions, a truth-telling compass—and horrors—children riven from their souls, lovers riven from each other, the deaths of protagonists, and, ambiguously, of God. Pullman’s fiction, like the Grimms’ tales, deals with the impossibility of drawing a bright line between evil and good, or of making a world that is all one without the other. It is a common misperception that the Grimms’ stories are parables, plotted for the purpose of punishing the bad and rewarding the good. In 1812, in their original preface, the Grimms wrote that “it was never their purpose to instruct, nor were they made up for that reason.” And so the tales seem to fit into Pullman’s longstanding authorial project: they are not neat visions of triumph over misfortune and terror, but explorations of those forces’ inexorable role in life. But Pullman’s self-proclaimed focus in his new book, Fairy Tales from the Brothers Grimm, which includes an introduction as well as notes from the editor, is neither the tales’ magic nor their malevolence. Rather, he writes, “my main interest has always been in how the tales worked as stories. ... I just wanted to produce a version that was as clear as water.” While it might be the uncanny blend of good and evil that gives these stories their imaginative staying-power, it is their structure that Pullman wishes to examine. The distinguishing feature of the fairy tale, as Pullman’s selection shows, is its frame—capable of holding both ice-bright magic and bloody horror in delicate balance. Yes, good comes out on top, but it does not garner entirely decisive victories. In some versions of Sleeping Beauty, the kiss that wakes the princess is not the end of the story, but the beginning of a chapter featuring a cannibalistic mother-in-law. Good characters are often powerless to be otherwise—youngest sisters, village simpletons, the vulnerable and the weak—but evil is pervasive. Iniquity is not a single figure, but a poison that seeps in: selfishness or jealousy that becomes obsession. Though a particular lying brother or vicious stepmother may die, evil’s capacity for resurgence seems inextinguishable. Magic and violence coexist in the world of fairytale, their interplay extending beyond the beginning and end of each discrete tale. And yet each tale possesses a balance: each problem is matched by an equal and appropriate solution. A flight from home ends in a rightful return; an evil deed is hidden, then revealed; a promise or a spell is put off for a time, but inevitably claims its due. This sturdy structure holds the potential for calamity and a countervailing magic. With these enormous forces—wonder and terror—safely contained by the narrative rules, life can go on at the end of each story. Though the tales are not parables about defeating evil, they are compact affirmations that it can be survived. Pullman seems to understand this fundamental aspect. When he fine tunes stories that seem ill-formed, he tightens them so the symmetry of opposite forces is apparent. In the “Twelve Dancing Princesses” (or, as he calls it, “The Shoes that were Danced to Pieces”), he adds detail that fills in and smoothes the story, eliminating distracting hiccups in the logic. By handling narrative strictly, and by emphasizing the incantatory repetition of Newtonian principles—no action without a reaction; every locked room must be opened, every prophecy must come true—Pullman makes the stories more powerful, and more fully what they are. Pullman’s greatest contribution to the Grimms’ canon is his reworking of the tale “Little Brother and Little Sister,” which begins with two siblings lost in the woods. They are pursued by an evil stepmother who turns Little Brother into a deer, and then they are rescued by a king who falls in love with Little Sister. At this point, the tale abruptly morphs into a ghost story—Little Sister is murdered by a jealous witch and her one-eyed daughter, but her spirit returns, justice is served, and her life is restored. In the original version, the sequence of the second half is incoherent, and trails off at the end. The author Jane Yolen has described “Little Brother and Little Sister” as “strangely conglomerate, as if two stories had been badly or inappropriately stitched together.” Pullman builds out the second half so that it is commensurate with the first, and he orders the flow of the narrative so that the happy ending, when it comes, feels deserved. By cleaning up what he calls the “clumsy storytelling” of the traditional version, Pullman allows the power of the tale’s tender opening and spooky finale to shine through. The book falls flat, however, in its annotations. These tales have been analyzed and appropriated by theorists of every stripe—“Freudian, Jungian, Christian, Marxist, structuralist, post-structuralist, feminist, postmodernist,” and so on, as Pullman notes in his introduction—and compulsively catalogued by historians and anthropologists. When Pullman dips into the academic, his layman status is glaringly apparent. He sorts the stories into “tale types” using an obscure academic index and haphazardly links their complex kinship to the folktales of other nations. At once too cursory and too erudite, Pullman’s notes do nothing to enhance a casual reader’s understanding. Their shortcomings are especially evident beside the richly analytical The Annotated Brothers Grimm, published in 2004 but reissued this fall for the anniversary. In this anthology, the Harvard folklorist Maria Tatar unpacks each tale with a depth of knowledge that Pullman can not rival. But for those who care more about a return to the heightened state of childhood than a lesson in history, Pullman’s book will be a welcome addition to the Grimms’ canon. 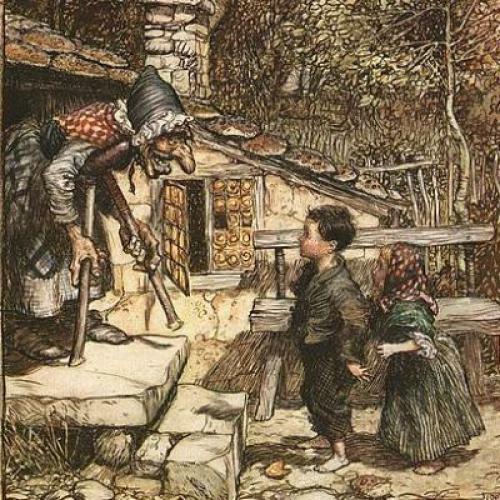 In “The Juniper Tree,” which many consider the superlative tale in the Grimms’ collection, a woman pricks her finger in winter and, taken by the loveliness of the crimson drops, wishes for a child “as red as blood and as white as snow.” It is an image of beauty inseparable from suffering, of extremes that meet in a single moment. In short, of the tales themselves: repulsive, resplendent, and as crucial to the fabric of imagination now as they have been for two centuries.